I first met Professor Liana Zanette and Dr Mike Clinchy at a conference in California where this awesomely inventive Canadian couple took the audience by storm in a riveting account of their work on fear. Inviting them to Oxford I hoped for a fruitful collaboration, but couldn’t have guessed the convoluted route that lay ahead. While working with us on badgers, and what frightens them (the answer is people more than wolves), Mike and Liana met WildCRU’s distinction-winning “Panther”, Badru Mugerwa from Uganda. 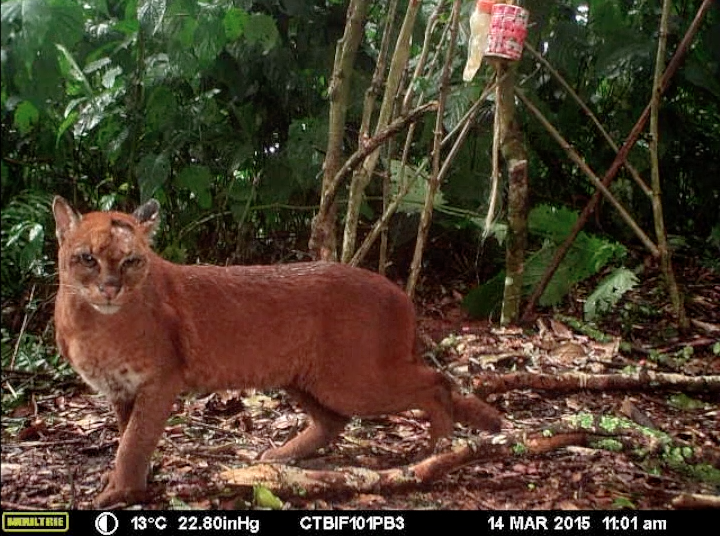 Their focus shifted from Oxfordshire’s badgers to golden cats in Uganda (another of WildCRU’s focal species) and soon we palled up with Dr Justin Suraci who nowadays is focused on an equally elusive cat, the cougars of California. Where has all this led? In terms of personal accomplishment it has led Badru, still associated with the WildCRU, to win a doctoral scholarship to study with Mike and Liana at Western University. 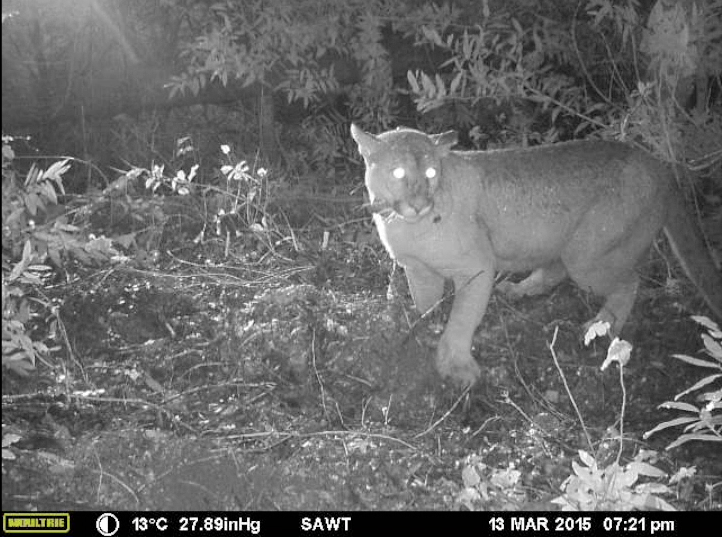 Professionally it culminates in a new paper in the journal Methods in Ecology and Evolution which describes novel technology for conducting experimental studies of rare and cryptic wildlife, such as African Golden cats in Uganda and cougars in California (see photos). Our hope is that this greatly expands the research capabilities of conservation biologists and wildlife ecologists interested in understanding the behavioural responses of wildlife to human disturbance, and species interactions. The study – led by Dr Justin Suraci, also involved collaboration with colleagues from the University of California and University of Victoria – describes a new Automated Behavioural Response system (ABR), which pairs a motion-sensitive camera trap with a speaker system for conducting audio playback experiments. In the last several decades, camera trap technology has revolutionized how scientists study wildlife by providing a fully automated means of observing and quantifying animals without requiring the potentially disturbing presence of a human observer, the major drawback of camera traps being that the simple presence or absence of a particular species is often all that can be measured. Audio playback experiments have similarly become indispensable in experimental ecology, allowing researchers to directly test the behavioural responses of wildlife to the sounds of, e.g., humans, predators, or competitors. However, playback experiments have typically required the presence of a human observer, potentially affecting the behaviour of animal subjects, and limiting the range of species on which such studies can be conducted to those that are easily located and observed by people (i.e., common species or populations habituated to human presence). By pairing camera traps with playback experiments, the new ABR combines the best elements of each method, allowing researchers to collect detailed behavioural data from wildlife (including rare and endangered species) without requiring the presence of an observer, thus empowering scientists to answer crucial questions in conservation and ecology, including how human disturbance affects threatened species. The new study also describes field tests of the ABR in three locations – tropical montane forests of Uganda; the remote temperate rainforests of British Columbia, Canada; and coastal montane forests of California – all of which answered pressing questions in conservation and wildlife ecology that would have otherwise been impossible to address; including how African forest animals respond to cues of poaching, and how cougar responses to human disturbance can cause cascading effects through an ecosystem. These three field tests explored the behavioural responses of cryptic, endangered, and highly human-averse species (including elephants, chimpanzees, cougars, and African golden cats) to the sounds of humans, predators, and competitors; and demonstrated the effectiveness of the ABR in conducting experiments on a wide diversity of species, ranging in size from elephants to black bears to squirrels. The authors of this new study hope that the ABR, and the novel research techniques it makes possible, will be readily taken up by other researchers to greatly expand the range of important questions addressed by wildlife biologists. They have and continue to make improvements in the design to greatly expand the capacities of this new tool, which is now commercially-available (see photos of improved ABR playback unit). For more information please contact Dr Suraci (justin.suraci@gmail.com) or Professor Zanette (lzanette@uwo.ca).